Design and construction of prototype equipment for space and defense applications. Engineering support for systems (Sector EA : 19). Select the DNV logo to go to their website for further infomation. Click to the image to download a PDF copy of our certification. 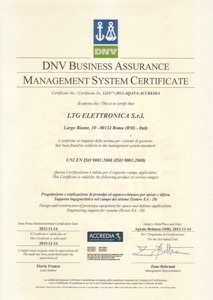 LTG Elettronica is member of Federlazio - Aerospazio e Difesa group, the association of small and medium companies (PMI) in the Lazio region. Click to the following link to go to Rome Aerospace & Defense Group.